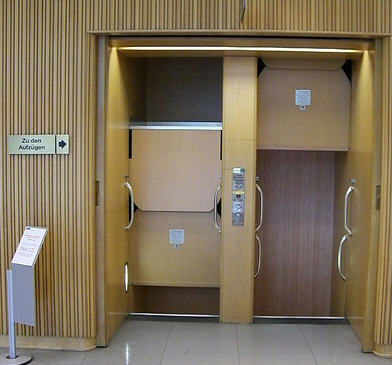 A paternoster or paternoster lift is an elevator which consists of a chain of open compartments (each usually designed for two persons) that move slowly in a loop up and down inside a building without stopping. 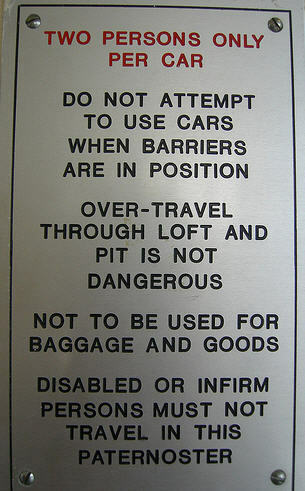 Passengers who are agile enough can step on or off at any floor they like. First built in 1884 by Londoner J. E. Hall as the Cyclic Elevator, the name paternoster ("Our Father", the first two words of the Lord's Prayer in Latin) originally applied to the device because the elevator is in the form of a loop and is thus similar to rosary beads used as an aid in reciting the paternoster. Paternosters were popular throughout the first half of the 20th century as they could carry more passengers than ordinary elevators. They were more common in continental Europe, especially in public buildings, than in the United Kingdom. A common misconception is that it is dangerous to stay in an upgoing cabin after it has reached the top floor or in a downgoing one after it has passed the ground floor level. The compartment remains upright, and travel is possible provided that the passengers remain perfectly still. Nevertheless there are two risks of such a journey. 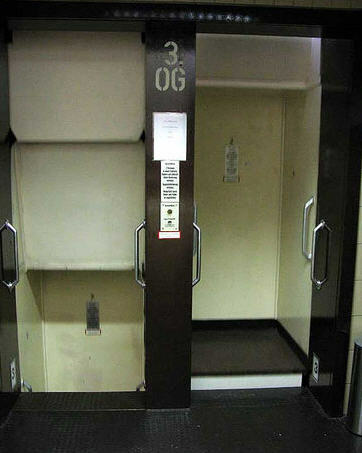 The elevator is liable to shut down if an occupant of the cabin shifts position during the cabin's lateral motion from the upward to the downward shaft or vice versa. Also, the drive chain is exposed above the top floor. 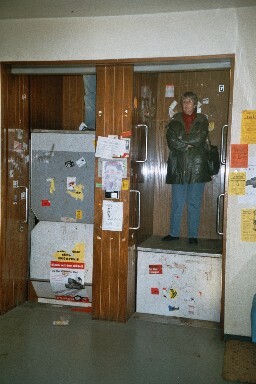 In 1989, the paternoster in Newcastle University's Claremont Tower was taken out of service after a passenger undertaking an up-and-over journey became caught in the drive chain, necessitating a rescue by the Fire Service. A conventional elevator was subsequently installed in its place. This accident led to an 18-month close-down of all UK paternosters for a safety review, during which additional safety devices were fitted. 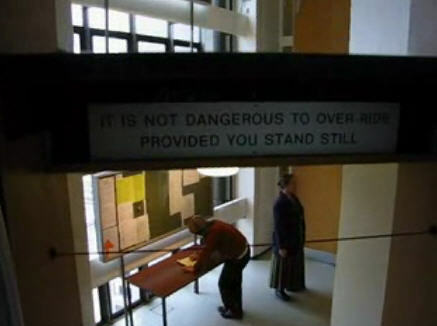 Today, in many countries the construction of new paternosters is no longer allowed because of the high danger of accidents (people tripping or falling over when trying to enter or alight). Also, an increased sensitivity to the needs of the disabled, e.g., wheelchair users, has led to the paternoster's gradual demise. Existing paternosters remain operative until they are dismantled, so their number is continually decreasing. As objects that belong to a vanishing world, for some people paternosters have achieved cult status. If you go to Homepage von Wolfgang Flemming - especially this page Technik - you will find a wealth of information on paternosters. 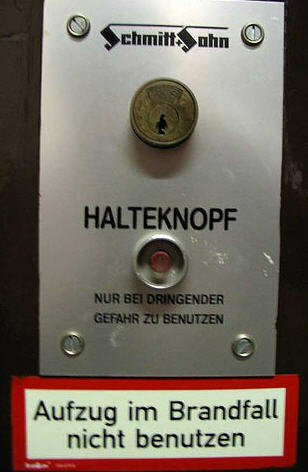 The site is in German but the photos are incredible...you will know how a paternoster operates after a visit to Technik! This animation from that page explains quite a lot. Where Are The Safety Instructions? Please...visit Homepage von Wolfgang Flemming especially Technik...you won't be sorry!